I am a convicted felon and a former CPA. As the criminal CFO of Crazy Eddie, I helped Eddie Antar and other family members mastermind one of the largest securities frauds uncovered during the 1980s. My responsibilities at Crazy Eddie included skimming, money laundering, insurance fraud, securities fraud, and a host of other criminal activities too long to list here. We committed our crimes at Crazy Eddie for fun and profit and simply because we could. We had no empathy whatsoever for our victims. During my sixteen years at Crazy Eddie and two years spent covering up our crimes after being terminated from the company, I never had a single conversation with any of my co-conspirators about morality or the suffering of our victims. Our conversations focused solely on the successful cold-blooded execution of our crimes. After two years of fighting government investigations and civil litigation by destroying evidence, engaging in witness tampering, and committing perjury under oath, I decided to cooperate with the government and lawyers representing victims of my crimes. I was the main witness in the Crazy Eddie criminal trial prosecuted by US Attorney’s Office in Newark, NJ, civil trial prosecuted by the Securities and Exchange Commission, and civil litigation brought against us by our victims. I did not cooperate with the government and victims because of any sense of morality or remorse for my crimes. I simply cooperated with them to avoid a long prison sentence and reduce potential monetary penalties. If my crimes had remained undetected and the government did not seek to prosecute me, I'd still be doing crime today. I pled guilty to three felonies: conspiracy to commit securities fraud, conspiracy to commit mail and wire fraud, and obstruction of justice. I was sentenced to only six-months of house arrest, 1,200 hours of community service, and paid approximately $10,000 in fines. In my settlement with the Securities and Exchange Commission, I agreed to a lifetime ban from being an officer or director of a public company and paid $20,000 of disgorgement for losses that I avoided by selling my Crazy Eddie stock at inflated prices. In my settlement with the victims of my crimes, I avoided all civil liability. Apologies for my crimes are irrelevant. Apologies do not undo the losses suffered by the victims of my crimes. I do not seek or want forgiveness for my crimes from my victims or society. There is a saying, "It takes one to know one." Today, I am a forensic accountant. 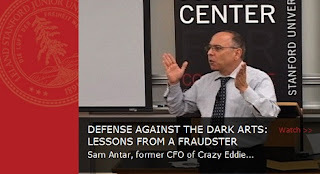 My primary work focuses on identifying and investigating public companies engaged in securities fraud by performing an in-depth (deep-dive) forensic analysis. In addition, I advise law enforcement agencies and professionals about white-collar crime and trains them to catch the crooks. My clients include government agencies, law firms, accounting firms, independent investment research firms, hedge funds, public companies, and other organizations. My blog investigates white-collar crime, securities fraud, accounting irregularities, corruption, and other related topics. Material from my blog has been used in investigations by the Securities and Exchange Commission and in class action lawsuits filed against certain public companies for improper accounting practices. Accounting irregularities investigated here are referred to appropriate government agencies as a whistleblower. In December 2008, my blog was recommended by the Journal of Accountancy. In August 2009, I testified as an expert witness on corruption for the New Jersey State Assembly Republican Policy Committee. In June 2012, The Huffington Post named me one of the 25 most feared financial reporters in America. My views on white-collar crime are frequently quoted in the print news media, online news media, TV media, professional journals, books, and blogs. I have appeared on CNBC, Fox News, Fox Business Channel, Canadian Broadcasting Corporation, Canadian Business News Network, National Public Radio's Planet Money, Progressive Radio Network, Reuters TV, RT News, and other media outlets to give insights on white-collar crime. My articles have been published by Business Insider, CNBC, Newsweek, Seeking Alpha, TalkMarkets, and other publications.